Do you have a family physician? Is he kind, compassionate, and easy to talk to? Does he make house calls? Is he able to diagnose and treat all the various maladies that beset the different members of your family, without having to call in one or two specialists? Does he guarantee a complete cure every single time if you follow his instructions? I’m sure by now you’ve experienced at least a chuckle or two, for we all know that we will never be able to answer “yes” to very many of these questions about any human doctor. However, there is one doctor who meets all of the above criteria. He’s been in practice for thousands of years, and He hung out a shingle in Exodus 15:26 advertising His availability to all who have need of Him. He gladly takes on new patients daily, and He specializes in hopeless cases. We’re referring, of course, to our dear Lord, Jesus Christ. Did you know that He is your doctor? Yes, the Almighty God who created our bodies and souls to be perfect, nevertheless knew that sin would invade our lives and with it the curse of death. Sickness, of course, is simply death in process. You see, God always intended to be the doctor for His people. He intended to remove sickness from them and cause them to walk in health and long life. His Word is full, from beginning to end, of promises about our healing coming from Him. Who is better qualified to do the job than the Creator Himself? He’s a doctor who never loses a case that is entirely turned over to Him, and His prescriptions have no negative side effects. Now, the Lord is not against us when we believe that we need to make use of human doctors or medications. Psalm 103:14 says that He remembers our frame, that we are dust. He realizes that most of us have been reared in a society, even a church society, that has, for centuries now, been taught that God doesn’t heal the way He did when Jesus was here in the flesh, and that medical science is one of God’s substitutes for what Jesus once offered. He understands that we must have time to let His truth create faith in us and set us free from those teachings. God has His own means of healing, which we discuss in detail in a later chapter, but He is so concerned that we be well and whole that He is willing to work through any channel that we allow Him to work through to get us well. If we believe we need a human surgeon’s hands, and if we pray, God will move heaven and earth to work through that surgeon’s hands for us. If we believe we need an aspirin and pray over it before we take it, God will bless that aspirin to do us some good. We must, by no means, belittle the human medical profession. On the contrary, most of the doctors and nurses that I have known have been kind, dedicated, sacrificing people. If it were not for them, many of God’s people who have not known the truth about healing would have long ago been dead. And even if all believers looked only to the Lord for their healing, there would still be millions of non-believers who would die miserable deaths and suffer untold agonies if they had no access to doctors and human medicine. Christians who have a desire to enter the medical profession have a real mission field among non-believers for that very reason. But beloved, as sons and daughters of God, we must always be raising our sights to God’s highest and best. We need to be honest with ourselves, and each other, and recognize that medical science is not God’s substitute for what Jesus once offered. Rather, medical science is man’s best effort to help himself. God’s people need to lay hold of that which is better. If we will stay faithfully in God’s Word, apply it in obedience, and spend time with Him in prayer, we will come to the place where we are fully convinced that God has healing for us from His own hand. We will come to a place of faith that will let us receive health and life from our Heavenly Father and not have need of man’s services. God is the most experienced, most knowledgeable, best equipped, and least expensive physician, surgeon, nurse, and psychiatrist in the universe. He’s the better way to health. We need to set our sights on His better way. We all know from experience that when driving a car, whatever direction we set our eyes is the direction our car will take. So it is in spiritual things. If we keep looking up – to God’s highest and best way for us – we will rise to live on that level. We must not condemn ourselves for walking where we are, but neither should we be satisfied with always living with less than God’s best. So what should we look at? JESUS. Is it that simple? Basically, yes. We can hear all kinds of arguments, using Scriptures out of context, to tell us that God may not want us well, or that He may insist on our having surgery or taking human medication in order to get well. In truth, if a believer were to take those over-used Scriptures in the light of all the rest of God’s Word, rather than the doctrines of men, revelation would come. I have often chuckled over the fact that so many who argue that we must use medicine, on the basis of Paul’s telling Timothy to take a little wine for his stomach, are the very people who believe that it is always a sin to drink wine. And I never fail to feel sorry for people who insist that Paul’s “thorn in the flesh” was a physical illness, when Paul clearly says himself that it was an evil spirit – “a messenger from Satan” – sent to cause him problems in the natural. (2 Corinthians 12:7). Paul, and every Christian, must be willing to suffer persecution for the sake of the Gospel. Jesus didn’t take that as our substitute. But He did take sickness, disease, and infirmity for spirit, soul, and body, so that we wouldn’t have to; and it is an insult to Jesus Himself for us to choose to carry them again in ourselves. There will always be arguments against believing God for our healing because, since the Garden of Eden, there have been arguments against taking God at His Word about anything. But as you, dear Christian, spend more and more time in the Word and prayer, the Truth will shed light on all those lies, and you won’t have to depend on your own reasoning to overcome all the arguments. So, does God Himself tell us in His Word exactly what to expect from Him concerning healing? He says in Psalm 103:3 that He “forgives all of our iniquities and heals all of our diseases.” Psalm 107:20 says that when the Israelites were sick and dying as a result of their sin, God “sent His word and healed them, and delivered them from their destructions.”The One Who forgives sin is the One Who delivers from its consequences. Are we saying then that sickness is always the result of sin? There may not always be a specific sin that leads to specific symptoms, but all sickness – death in process – is the result of sin gaining ascendancy over man in the Garden of Eden and bringing in the curse, which would eventually destroy all that sin had contaminated. In Deuteronomy, chapter 28, when the Lord, through Moses, is instructing His people about the blessings of following Him and the curses of refusing to walk in relationship with Him, He lists a multitude of specific things involved in that curse. He names numerous diseases specifically, including mental sickness. But just so there won’t be any misunderstanding, in verse 61, He says that all sickness and disease experienced by man are part of the curse of the broken law. But the great news is that according to Galatians, chapter 3, Jesus took that curse for us, and we now have become inheritors of the blessings. Could it be clearer, Beloved? Isaiah was prophesying a Savior who would fulfill all of the covenant promises of the Father God, including the promise to be the perfect physician for His people. Notice that this prophecy, when translated fully from the Hebrew, includes griefs, sorrows, and distresses, all of which affect the mind and emotions. And if we will look at Isaiah 61:1, we find the picture of Jesus coming to heal the brokenhearted also. Jesus says in Luke, chapter 4, that He has come to fulfill the prophecy in Isaiah 61, so we can have confidence that there is no hurt or brokenness is our spirit or soul that is not also covered by Jesus’ work. I can testify personally to two different times in my life when I experienced such a broken heart that I thought surely it was too shattered for the Lord to heal it completely. But, dear Christian, when I turned it all over to Him, He so completely healed my broken heart and restored my joy that I can barely remember how hopeless I felt. Jesus did that for me; no one else could have. He’ll do it for you too. Hebrews 1:3 says that Jesus was the “exact representation of the nature of God.” He came to show us in the flesh exactly what God is like and what He will do. Indeed, He gives us such a complete picture of Himself as a compassionate, faithful doctor that if we will but look at it long enough, every doubt and fear will dissolve away, and we will have total confidence. 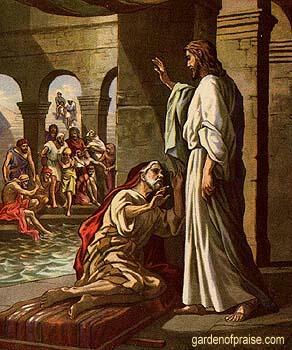 Sometimes we look at the leper that came to Jesus in Matthew 8:2-3 and said, “Lord, if you are willing, you can make me clean.” Now he hadn’t had the opportunity of getting to know Jesus well enough to know for sure that He was always willing to heal. But you’ll notice that Jesus didn’t waste any time letting him know. His immediate response is, “I will.” That settled the question, and that leper was able to tell people everywhere he went that Jesus was not only able, but very willing. Jesus’ response to the centurion in that same chapter is equally as quick. As soon as He hears the need, He says, in verse 7, “I will come and heal him.” Look at His willingness, beloved. He is so willing to heal – so hungry to meet the needs of His creation. Beloved child of God, let the picture of this event sink down deep into your spirit. See the brilliance of it as it outshines any other Scripture in expressing the finality of God’s decision to heal His people. Oh, I can rarely think about it without tears springing to my eyes as I fully realize what our dear Lord has done for us. Examine the story closely, you who are still fearful that God may not be willing to heal you. This little woman had heard of Jesus. No doubt, she had heard many tell of His compassion, His wisdom, and His miracles. She may have even heard Him speak with her own ears, although that is doubtful, since she was considered unclean in her diseased state and probably would not have involved herself in public gatherings, except in this desperate hour. But she makes it clear by words from her own mouth that she has heard enough to know that this man is a healer. He has healing in His nature; He is so saturated with healing virtue that it even flows through His garments. She makes up her mind that she is going to have some of it, presses through the crowd, lays hold of Jesus’ clothes, and receives complete healing. Did she ask Jesus to heal her? NO. Did she ask if it was His will for her to be well? NO. Beloved, do you see? Not only did this little woman not ask Jesus to heal her; she did not even get His permission to take healing virtue from Him. Jesus Himself didn’t know that anything was happening until He felt that healing power flow out of Him. Even then He didn’t know who had received but had to ask. “How could that happen?” you may ask. Well, God’s nature is healing, and He sent Jesus to manifest His nature in the flesh. That woman saw that healing nature of God, accepted Jesus as the appointed vessel to dispense it, operated on her God-given covenant rights, and took her share, without asking. No need to ask. No need to get permission. God had promised, and then sent the fulfillment of the promise. His decision was made. He had come to set His people free from sin and deliver them from the curse. When a heart full of faith connects with the forever-settled Word of God, it’s like striking a match against a hard surface: the result is inevitable. Hallelujah! It would be good for us to look at another woman who recognized something in the nature of Jesus that caused her to know He could not refuse her healing. In Matthew 15, beginning at verse 21, we meet a Canaanite woman who has a daughter who is demon-possessed. Now this woman did not have a covenant with Jehovah as the Israelites did. She did not actually have the same legal right to God’s provisions of deliverance and healing as the covenant people of God did, but she had a desperate need and had perceived something in Jesus that caused her to know that He could and would meet her need. Jesus does not speak to her immediately. When He does speak, He reminds her that He was sent to the covenant people of God. Her only reaction is to ignore any indication that she doesn’t fit the requirements and to continue to press in to get her need met. Then Jesus speaks more directly. Many may think our Lord cruel in this conversation, but He is working to draw something from this woman for her good, and for the good of those who are watching, and those who would later be reading of this event. He tells her that deliverance and healing are the bread that belongs to those in the covenant family of God, and not to those who are outside that family (who were often referred to as “dogs” in that day). It has always seemed so remarkable to me that this woman could stand to hear such an answer and yet never waver in her expectation that Jesus would give her what she asked. Jesus is so pleased with her response that He calls her a woman of “great faith,” and He grants her request fully. What was it that marked this woman as being “great” in faith? She saw in Jesus the goodness and compassion of God, and she knew that could not fail. She ignored everything to the contrary. She would not consider any other answer but that this living God would meet her need. She determined to look only at God’s loving nature, to press into it and hold on, somehow knowing that very nature would not be able to refuse to meet her need without denying Itself. Beloved, that’s the way God feels about it. If we will meet Him on the line of total faith and commitment to Him, refusing to give attention to anything to the contrary, His very nature and faithfulness to His Word will not allow Him to refuse us the help we need. ALL, ALL, ALL. There was never one to whom Jesus said, “No”. There was never one to whom He said, “You’ll have to wait.” There was never one to whom He said, “I’m trying to teach you something through this sickness.” No one seeking healing ever heard Him say, “I can’t heal you because it’s time for you to die.” (On the contrary, He recalled several from death.) There was never one to whom He said, “Go down the street to Doctor So-and-So, and I’ll give him the wisdom to give you an operation, and you’ll get well.” No, dear Christian. God never changed His mind. He sent Jesus to destroy the work of the devil. That’s why Jesus healed all that were oppressed of the devil. We never have to wonder if sickness is from God. God sent Jesus, and He healed every oppressed person, saying all the time that He was only doing the will of the Father. He’s still doing the same thing today. How can we be sure? Malachi 3:6 says, “For I, the Lord, do not change.” And Hebrews 13:8 says, “Jesus Christ is the same yesterday, and today, and forever.” He has healing and deliverance for you today. If you’re sick, make an appointment with the Great Physician, and let Him make you well!